In the period of half sleep. Somewhere between fully aware and comatose I’d heard a moped buzz angrily down the street. Gaining consciousness two and two became four again. The moped must have been snow scooter, the street the loipe. It’s Saturday morning and the tracks are being prepared for the day folk. I awake early but all things are relative. It’s six o’clock by my watch but the fact is I’ve been in my bag for eleven hours straight. Apart from a couple of wakeful periods, during one of which I was compelled to re-inflate my mat, I’ve slept virtually continuously. Deeply too. My oldest is now two years and ten months, give or take. For two years and ten months, give or take, I’ve been struggling along on, at best, six hours of broken sleep. When I tell people about wild camping most of them react with genuine concern. For the uninitiated, sleeping outside, in the cold and wet, on the hard uneven ground, amongst the bighting beasties, seems to conjure up images of hardship and long sleepless, black nights. The truth is it’s a real luxury. More comfortable and sleep enticing than even the finest five star hotel with it’s too soft beds and it’s dry, overheated, air-conditioned rooms. Even in this cold, perhaps especially in this cold, I’ve spent a comfortable night. Only during one period did I feel any cold at all and then, as a side sleeper, only at the knobbly contact of hip bone and compacted snow under my failing mat. A problem easily solved when you’ve overcome the natural, if illogical, reluctance to extract yourself from your warm bag and take action. Anyway, however I look at it, from my perspective, ten hours of deep, uninterrupted sleep is a wondrous thing. It would seem that Theo has slept well too. At least he seems bright enough. Then again, when isn’t Theo in a good mood? He thinks it’s too early. I tell him how long we’ve slept. He still thinks it’s too early but he’s happy to let me make breakfast. Breakfast in bed! Who needs a five star hotel room? I sit up in my bag, unzip the inner and reach into the porch setting up the stove. The last of yesterdays water is decanted into a pan and the process of melting more snow starts. In no time we each have an expedition breakfast under our chins and a mug of hot chocolate balanced by our sides. Perhaps the Teasmaid wasn’t such a bad concept after all? The process of melting snow continues for a little while longer but when the flasks are full all excuses are used up. It’s time to move. We’ve faired pretty well on the whole. Just a little dampness here and there. Mostly caused by condensing breath and the in-tent snow falls as our movement knocks the hoar off the inside of the inner tent. Then comes the worst part of the day, out of a warm bag and into cold clothes and boots. The clothes warm quickly. The heavy leather boots don’t. With as many layers as I can muster I step outside and launch straight into the morning ritual. Two trenches, part tramped, part dug, lead off from our tent, one to the kitchen and one to the bathroom. In the interest of avoiding mistakes the rooms have been colour coded. The kitchen we’ve kept white (a subtle shade of snow white in fact). Modern, clean lined, a feeling of space and simplicity. The bathroom a warm, cheerful yellow. As I do my share of the decorating I look around for the first time. The air beyond my breath is crystal clear. The sky draped with cloud but high and wispy. The sort of cloud that serves to add interest for the morning but is on it’s way long before the sun gets its act together. As I take in the scene it’s beauty becomes apparent. Not all at once but gradually as the light and colour of the sky and the length of the view slowly penetrate the last of the early morning fugg between my ears. I head back to the tent, collect my camera and take the first of a long series of photos. Tent as foreground interest, Norway as backdrop but the sky as the real subject. As the sun climbs somewhere behind my back, somewhere behind the hill, the changing fall of light is translated as changing colour projected onto the clouds to the north. 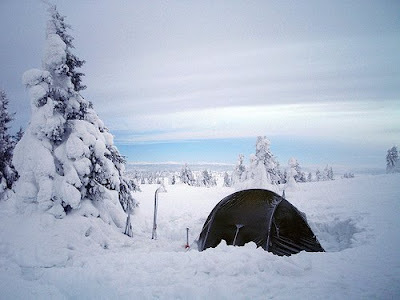 In that first photo the blue-white, green and blue-grey of snow, tent and sky are complimented by patches of blue sky. Not sky-blue sky but a pastel, powder blue. Somehow unnatural and unexpected. As the sun climbs those accents steer a course through the spectrum, powder blue becomes salmon, salmon becomes orange. I stand and watch and, hemmed in by deep powder, shoot from a single perspective, no fiddling with settings, trying not to look at the result, keeping my fingers crossed, preserving my chilled battery. Thim and Willem-Maarten are out and about too. They’ve chosen to take breakfast on the veranda and stand looking at my view. Looking south, over their shoulders, I catch a glimpse of their view, equally stunning, warmer light bounced of high cloud. It’s going to be a fine day! Willem-Maarten is quick with breakfast and quicker to put his boots into bindings. Before the rest have got their act together he’s breaking trail behind camp. Heading off uphill to take a look around. A little later Theo slides off to join him soon flowed by Thim. I stay in camp taking more photos and then readying myself for the day ahead, stripping excess layers and packing. Willem-Maarten reappears and encourages me to join the others up the hill. As it turns out we’re not a hundred meters from the summit of Veslehaugen. With remarkably little effort we’ve bagged a 1000m top. Not much to look at. It's prominence can be no more than 30m or so. Just a knoll poking out of the high plateau of Oyer Fjellet. But it’s nevertheless adorned with an impressive, solid built, stone cairn to kiss for good look and it’s fine to look from. Standing on its top, a man of 1m 85cm or thereabouts is a half a body length above the tops of the highest trees. 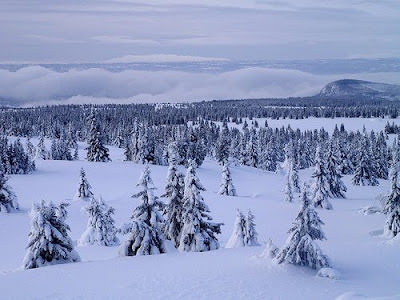 Norway in winter stretches out all around me. The big guns, Rondane perhaps, look down from the North. To the South smaller hills and cloud filled valleys. A cloud inversion! My breakfast is still warm in my belly and I’m leaning on a cairn looking down at the clouds. I could go back home a happy man already. They say that what goes up must come down. With the exception of deep space probes that rule seems to hold. Willem-Maarten leads off, telemarking straight down the tracks he’d cut earlier. Skis refusing to turn but staying upright. Theo follows in much the same style. leaving just myself and Thim. This is going to be interesting. I let Thim go first. He gets down. Part of the way on his face but there’s no arguing the fact that he’s at the bottom. I push off on a shallower traverse and try to plough, intending to try and turn, speed is hard to find in the deep fluff but I'm mostly in control. Before I initiate a turn I realise my line is taking me to a step. A less than elegant but effective enough kick turn gets me onto the opposite traverse and another slow descent sees off the last of the hill. I’m down. I’m vertical. Marks for style? Zero! Confidence? Still basically intact. Back at camp we prepare for the off. This new shiny plan allowed not only for a light first day but for lighter packs on the second. 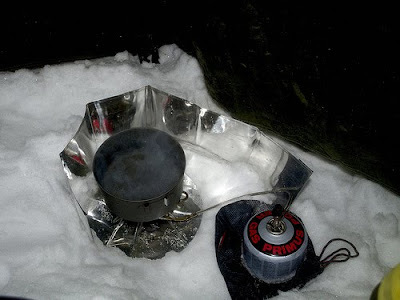 The intention is to leave the tents pitched, leave some food, the bulk of the fuel and a stove behind, and to make for the DNT hut on the shore of Djupslia lake where we'll overnight and then to return to the tents on the third and last night. Again the distance is moderate and the relative close proximity of the hut allows a large margin for error. The tricky bit will be navigating back to the tents in the event of significant snow fall or poor visibility. As we pack a snow-scooter, almost certainly the dawn moped, trundles along the track in the direction of Steinsetra. The driver looks at us and we look back. Contrary to expectation the tents are clearly in full view of the track. 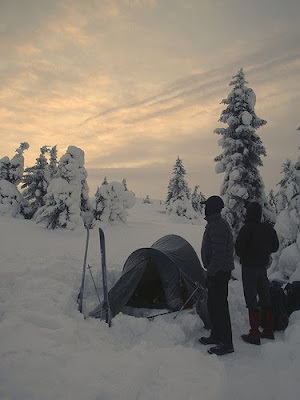 Nevermind, the compensation is that proximity to the track and the cairned top of Veslehaugen will make finding the tents that much easier. Packs on backs we kick gently down to the track. A right turn sees us facing east and we’re off along the track again. 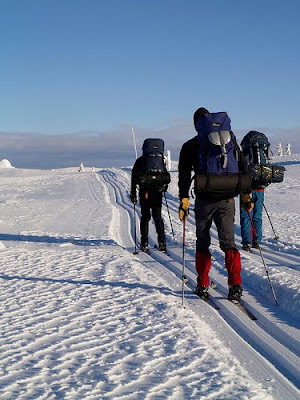 Our broad skis fit perfectly and glide easily in the freshly pulled grooves. First comes the remainder of the climb started on day one. Then we’re on the shoulder of Hogasen where the terrain levels out and a little later we’re descending a gentle incline. Not steep enough to schuss but enough to lighten the kicks and extend the glides. The snow-scooter drivers early start shows. The track kinks, twists bucks and dives left to right and right to left. Nothing difficult but on occasion just enough to knock a ski of course and break the rhythm. Rhythm is everything. Not expecting wet I’ve dispensed with a camera bag for this trip. My camera hangs around my neck and is tucked under my smock its swing killed by the chest strap of my rucksack. As we progress the sky clears, the sun shines and we’re treated to a blue and white spectacle. 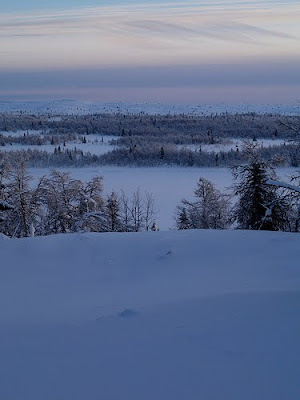 Long, shadows thrown by the shallow Northern light bring interest to the white canvas. The snow is studded with glittering diamonds. I stop often to take photographs. The accessibility of my camera encourages more. The temperature differential on passing from my smock to the crisp open air makes condensation on the lens a real problem. Before long my polariser is smeared and unusable and gets retired to my pocket. Then comes the first real descent of the weekend. Nothing too difficult. Not too steep. No tricky curves. An easy glide straight down. I pause to take a photo and then at the same time as Thim in the opposite track, pole to get things moving, confident and deliberate. Several seconds later it's carnage. Two bodies and bits of kit are spread over the track. I’m not sure what happened to Thim but apparently my feet were intent on descending faster than the rest of me. Now swearing, I start to pick myself up and discover that recovery whilst wearing a heavy pack is a sport in its own right. Finally upright I push off again, let the skis run and whoosh. Not the exhilarating whoosh of rushing air. Oh no. Again the whoosh of static snow as my ear carves a turn along its surface. This isn’t good. Not at all. 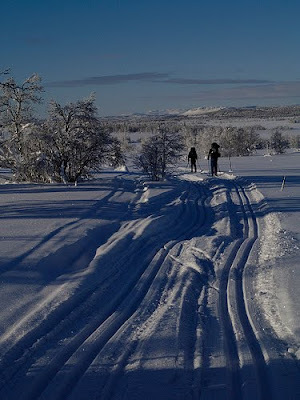 I’m sure the last time I was on Nordic skis I was getting down this type of slope without too much bother. A rough calculation suggests that two more falls should get me to the bottom of this one. As it happens I was out by one. Regrouping we continue along the track. Unfortunately the same pattern repeats itself. Easy kick and glide followed by easy downhills for Theo and Willem-Maarten and crash and burn for myself and Thim. Practice isn’t making perfect. At least not at a rate of improvement that will see me confidently covering the last kilometres to Djupslia. On a wider track I may have skied down out of the tracks on the skating surface but here that’s not an option. All that separates the grooves is an untidy pile of loose snow churned up by by the scooter. We stop for a break, dig seats, get comfortable and I take consolation in the view, still breathtaking through the funk of hot frustration. When the blood stops rushing and the pulse is back to normal the reality of the situation hits home. I’m in Norway, in the snow, the sky is blue and the sun is actually burning. Things could be a lot worse. If the secret of good planning lies in timing then we’ve struck gold this weekend. As we sit and eat the first of the day folk skis past. It’s been around 21 hours since we left the car park. The rest of the route continues in the same vein. Steadily covering ground in the tracks, photographing whatever catches my eye, enjoying the company of the others and enjoying the periods of separation from them in turn. The route takes us over more open high ground loosely studded with low conifers, past tiny communities of private huts which at this time of year, tracks and roads concealed under meters of snow, appear infeasibly inaccessible to the families that own them, and finally across the Djupslia Mire. I imagine that this flat, dwarf birch strewn stretch of ground at the western head of the lake is very different in summer. A wet, soggy mess, humming to beat of tiny wings. I imagine all the little mosquitoes sleeping soundly two meters beneath my feet dreaming happy dreams of sweet tasting foreign backpackers with single skin tents. We see two more people taking the tally to three for the whole of Saturday. Its popular here! For the last couple of kilometres around the head of the lake and along its northern shore the hut is clearly signposted. From the mire the climb is sustained. Three kilometres or so of up. Willem-Maarten has shown the group his heels, I suspect a little out of frustration, he could do so much more if he was free to set his own pace. My reflex action, honed by years of being barked at by teachers and instructors alike, is to keep groups together and I try to close the gap. Trying, without success, to keep Thim and Theo in view over my shoulder and Willem-Maarten in sight up ahead. In fact I succeed in losing site of everybody. It’s such a fine day and the route is so clear that nothing can go wrong. Can it? Probably not. My efforts were in any case wasted in all respects other than that they get me to the final destination quicker. I’m quite glad to see tracks leading into the trees from the final hut sign. At the same time I’m surprised that there appear to be a single set of fresh tracks. Could we be the only people to visit the hut since the last snow fall? Well and truly arrived, I can relax, and shamble off down Willem-Maartens trail. However, my feet are, once again, set on getting there first and I find myself lying on my side in the snow. By now, a familiar feeling in all respects but one. This snow is not consolidated. If getting upright on skis on a prepared trail is a sport, then doing it on powder is the elite version. It takes me several minutes of wallowing around before I 'm on my feet and only then after a herculean effort that I’m sure involved bursting blood vessels in my head. I make my way down the remainder of the trail more cautiously, even side stepping the steeper bits, avoiding another fall at all costs. As the hut swings into view it’s apparent we’ve made a good choice. Idyllic would be an understatement. As I close on the hut I can’t see any skis next to the door. No tell tale signs of company. Two paces further and I see the peculiar, heart shaped, DNT padlock hanging in the hasp. It would seem that we have the twenty one bunk hut to ourselves! After performing, what to a Norwegian might have been interpreted as some sort of strange English homecoming dance, I’ve removed my skis and my pack and am standing, on just my feet, on solid ground, in front of the door. Willem-Maarten clears the piled up snow and I pull the chord to which the hut key is attached out of the side pocket of my rucksack. The key in view, and safely secured on the end of the chord I joke with Willem-Maarten that he better be nice to the key holder if he wants to sleep dry and warm tonight. As the joke is falling flat I catch sight of the key also falling. The two of us spend the next five minutes crawling around on all fours trying to find the tell-tale key shaped hole in the snow and retrieve the key. I’m having visions of cold nights and collapsed down bags when the key finally reappears. I open the door without further attempts to entertain the guests. Inside we find a well provisioned (strangely enough for a boy out of Liverpool with amongst other things a years supply of tinned lobscouse), tidy, living space, with solar powered electric lighting, three bunk rooms and a huge cast iron wood burning stove. Indeed, Idyllic just doesn’t suffice. The temperature inside is about the same as that outside, at a guess still around -10C, so the first job is to light the stove. In the woodshed next to the hut we find a huge store of dry logs and, after warming myself up preparing kindling, I warm the room with a fire. In the meantime, Theo and Thim have joined us and, spirits running high we sit back and relax. Although it's still quite early, I've reached the end of my day. I'm happy to just to settle down, keep the fire burning, and enjoy the hut and its surroundings. Willem-Maarten and Theo, reluctant to waste daylight head out for a little off-track skiing. Beforehand, a night in a hut always seems to me to be selling short. Cheating somehow. Cheating myself out of a night in the open. Mostly though, when I get inside I'm quite happy to be inside. This time is no exception. A chance to warm toes, treat blisters, drink hot tea and dry damp gear is welcome. Apart from a short trip out to take some photos in the evening light and again after dinner to look at the stars on what turns out to be a clear cold night I stay put. So does Thim. The spectacular night sky rounds off what has been a good day. The constellations I see in the skies under which I live and work are still there but now the spaces between are filled with countless millions of strange stars and the milky way burns a path through the blackness. Before bedding down I open the curtains. Who knows. Maybe the northern lights will make and appearance? Spectacular, Dave! Spectacular photos of the whole day (sadly the stars are missing ;) and spectacular writing. I lost my home key on the last trip, and happily one member of the group found it. Not fun losing keys in the snow. I do agree with you that a night in a hut can be very relaxing and good for the mental health of a wanderer. The warmth of an oven/ stove, looking out of the windows, that are things I do cherish as well from time to time. Dave, thank you once again for cheering me up. 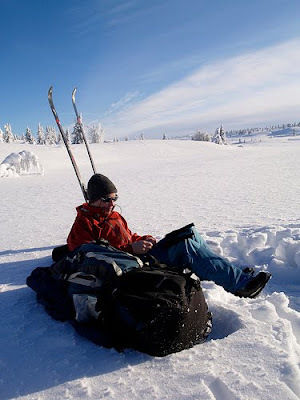 Your account of flailing around in the snow while the locals effortlessly glide by is something I am all too familiar with. Your writing style had me in stitches, much to the amusement of my Norwegian house mate. I don't think it's cheating to use a hut, the bloody things are everywhere! On the Arctic trail this summer they will be a welcome refuge when I want to dry all my possessions every once in a while. 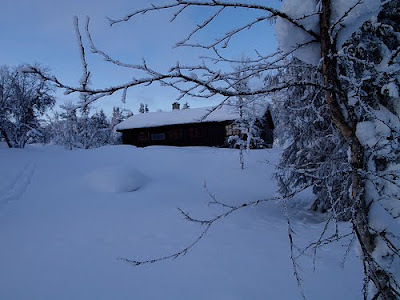 We were realy lucky, privaledged even, to get that hut to ourselves. Fantastic location. Lovely place to spend an evening. Hendrik, the star trail photos are missing indeed. I didn't pack mt tripod. Not a mistake I'll make twice. All the huts I've visited would be a welcome refuge on a cold, wet night! 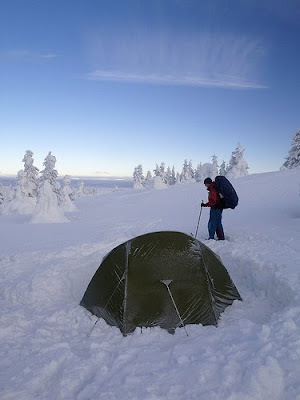 True the standards vary from hut to hut but the basics are usually there to get warm and dry. 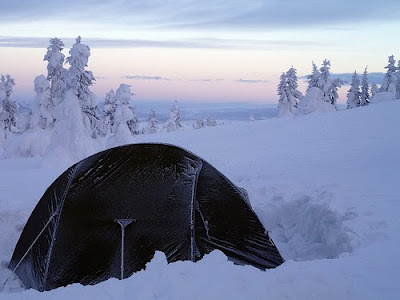 The wide availability of huts has also had a bearing on my choice of a down quilt instead of a synthetic one which would be prudent on more remote Arctic trails, such as that being attempted by Andy Skurka this year. And you got that mighty fine Velbon Vpod, Dave! How did it get left behind - a last effort to push down the weight ;) ?! Part three better go online tomorrow morning, I have a 2,5 h train journey and need entertainment (and distraction, holding a presentation to 17 people in Finnish has me seriously fussed up). 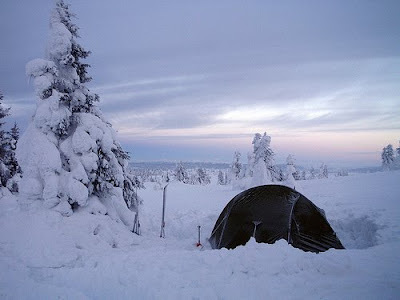 Hendrik, No, I got to Norway, set up camp and it just wasn't in the bag. A lot of preparation for this one was left very late. It wasa dissapointment not to have the tripod to hand but I got over it. Forgetting my passport was potentialy much worse, a mirracle that I remembered close to home. Sorry to dissapoint you but I'm strugging to make time for part three. I'm sure you'll find something else to take your mind off the presentation. Once started to learn Finnish (its a long story). Realy wouldn't want to try it out in public! Break a leg!